San Francisco Bay Area Interior Designer, Best of Houzz 2013-2018. Annie Lowengart leads a full service luxury interior design team offering a unique level of customization and style. Our focus is not singular in that we create warm, chic and inviting interiors, but we also create a fabulous experience for our clients from consultation through project completion. Our clients value our approach and Annie breaks down her process simply: “I listen to what my clients want and then, after thorough research and running numbers, I tell them how long it’s going to take and what it’s going to cost.” It’s about transparency, but the fact is, “When the financial and timeline stress is taken away, the client can actually enjoy the creative process.” Ann Lowengart Interiors has been featured in Architectural Digest, Elle Decor, HGTV Magazine, Town and Country, and The Ellen DeGeneres Show. Environments are reflections of those in them, so creating unique spaces for each client's lifestyle is key. Hailing from NYC, design inspiration is gathered from both coasts. 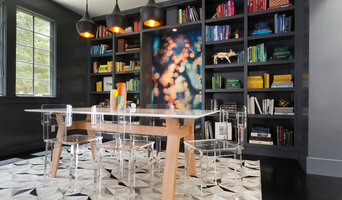 Mixing wonderful textiles, furniture, lighting, color and accessories - a special look is created for each project. Every effort is made to make clients happy while making their homes beautiful. An Architectural Color Consultant, I am an expert in how to narrow down the overwhelming color choices to the few that are best for your space. With my knowledge of the undertones of color and the extreme impact light has on color, I educate clients on how the color will appear on the interior or exterior of a residential or commercial space. Marin Luxury Interior Design Services and Store Best of Houzz 2X! 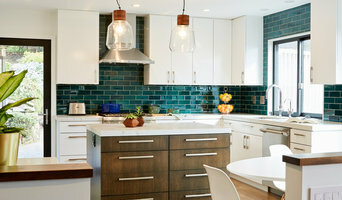 Marin County's Expert Interior Design Firm Best of Houzz 3x! Working with homeowners and business owners, we help bring all the elements together for remodeling or new construction through design. Our goal is to tell your story through design, bringing your dream space to reality. Jenny has residential and commercial experience in San Francisco, Napa Valley, Marin County and Healdsburg areas. Her work has been published twice in Trends Magazine and featured on HGTV. She is a product of the highly esteemed interior design program at Kansas State University, which has been ranked consistently in the top 3 in the U.S. and top 15 in the world for Design. Her expertise ranges from New Construction, Remodels, Kitchen and Bath design, space and furniture planning, along with detailed Architectural Elements and Architectural plan review and analysis. "My goal in working with my clients is to first get to know them and a clear picture of what they want to accomplish. From there we can work to put all the necessary puzzle pieces together to make their dream a reality. My reward comes when we have achieved that goal." Jute offers full-service design to clients throughout California and to select national and international sites. Our work has been featured in Elle Decoration, Luxe, and AD and we have been granted awards by Elle Decor, CA Home + Design and the San Francisco Design Center. Specializing in Kitchen and Bathroom design with an emphasis on reconfiguring spaces for better flow and functionality. From luxurious to budget friendly spaces, as well as everything in between. Offering a full range of services from design consultation, design concept, and finish material specification to project management. Bay Area Interior Designer Best of Houzz 2014 & 2015 Visit us today! A good home design professional will hone your style down to its very essence and be able to choose a functional layout that feels natural to you. Interior design companies can be involved as much or as little as the client desires. Many clients who hire an interior decorator in Belvedere Tiburon, CA — particularly those who are remodeling — have a good sense of how the room should look and what products they should use. Often clients will insist that interior decorators use the products already present in the house. Other times a designer will need to start from scratch — especially if this is a newly purchased or just-built home. An interior design company will need to figure out exactly what the client needs, which includes organizing rooms, picking flooring and wall colors, and finding furniture to complement it all. Sometimes that means he or she will have to recruit help from other Belvedere Tiburon, CA home professionals to help create the perfect look for your renovation. Here are some related professionals and vendors to complement the work of interior designers & decorators: Architects & Building Designers, General Contractors, Home Builders, Design-Build Firms, Photographers. Do your research before meeting with an interior designer or home decorator in Belvedere Tiburon, CA. Ask yourself what you want your space to become and what it will be used for. Figure out the extent of what you need help with, what your must-haves are and what your budget is. Interior design services can add up fast, so be up front with a potential design firm or individual from the beginning. Also, pick an interior decorator that fits your style. Browse through the portfolios of different Belvedere Tiburon interior design firms and decide if you would live in those houses. Just because you like something doesn’t mean you could live in it. There's a big difference! Find an interior designer or home decorator in Belvedere Tiburon, CA on Houzz. Narrow your search in the Professionals section to find Belvedere Tiburon interior designers near you. You can also look through Belvedere Tiburon, CA photos to find a room you like, then contact the design firm who designed it.